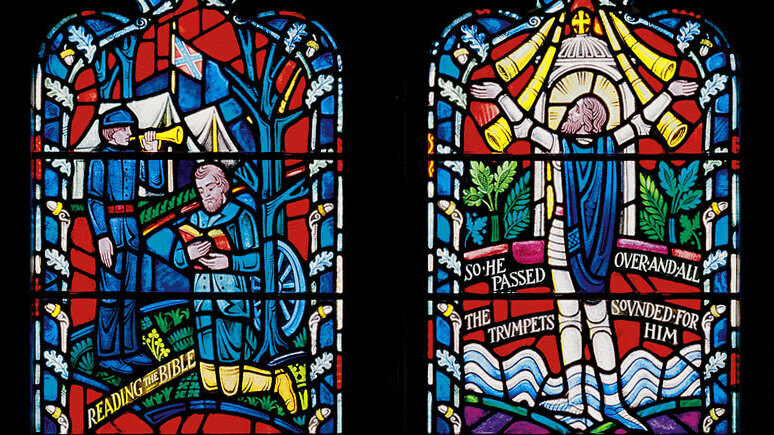 National Cathedral Will Remove Confederate Flags From Stained-Glass Windows : The Two-Way The windows, which honor Gens. Robert E. Lee and Stonewall Jackson, will remain during a period of "public dialogue" on race and slavery. But the battle flags will be replaced with plain glass. 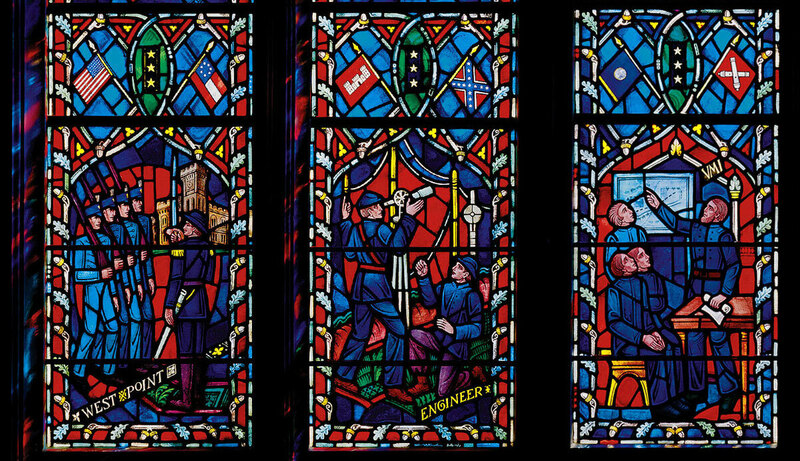 The set of windows at the Washington National Cathedral honors Confederate Gens. Robert E. Lee and Stonewall Jackson, showing scenes from their lives. The Washington National Cathedral says it will remove two images of the Confederate battle flag from the building's stained-glass windows. Then the church will hold a period of public discussion on issues of race, slavery and justice and revisit the question of how to treat other depictions of the Civil War on the windows. The windows in question memorialize Confederate Gens. Robert E. Lee and Stonewall Jackson; they were installed in 1953 after lobbying by the United Daughters of the Confederacy. They feature images from the lives of the two generals and include two Confederate battle flags. A five-person task force that examined the windows' symbolic power said the flags cannot remain on the cathedral as they have thus far in the building's history. But instead of quietly taking down the windows, the task force said, just the flags should be replaced — and then the windows should be used as a starting point for a series of conversations. "[T]he windows provide a catalyst for honest discussions about race and the legacy of slavery and for addressing the uncomfortable and too often avoided issues of race in America," the task force found, according to a press release from the National Cathedral. One member of the task force said the windows raise a question about race and slavery in America, "and instead of turning away from that question, the cathedral has decided to lean into it." A series of panel discussions and events exploring race and racism will kick off next month at the cathedral in Washington, D.C. The windows twice feature the Confederate battle flag. During the period of discussion, the windows as a whole will remain in place. But the Confederate flag images, specifically, will be removed and replaced with plain glass, a process that will be paid for by private donors, the cathedral says. Within the next two years, the Cathedral says, the church's leaders will revisit the question of how to treat the rest of the Confederate War-themed imagery on the windows. Last year, the Very Rev. Gary Hall, then dean of the cathedral, told NPR that it was time for the windows to go and announced that he had called on the cathedral leadership to start a process to do that. "I'm not trying to whitewash our history. I'm trying to celebrate our history. But since the cathedral tells the story of America, and just as America is trying to come to terms finally with the Civil War and slavery and racism and segregation, it seems to me that it's more appropriate for us to have windows that tell that story in all of its complicated fullness than just present a kind of public relations picture of a couple of Southern generals."